Mommy's Favorite Things: Pink Lemonade Shop 9 year Anniversary with Giveaway! 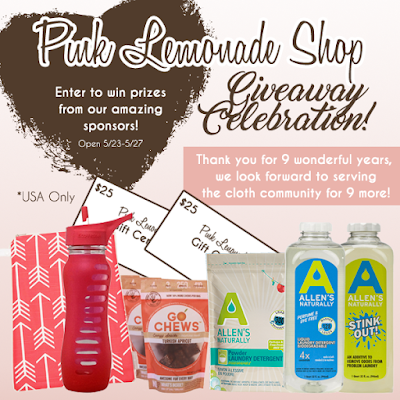 Pink Lemonade Shop 9 year Anniversary with Giveaway! Pink Lemonade Shop is celebrating 9 years with a Cloth Pad Chat and Giveaways galore! Pink Lemonade Shop is turning 9 Years old this week and they're celebrating in the most awesome way possible. They've teamed up with several great brands and bloggers (like me!) to bring you a cloth pad chat and tons of giveaways! Monday through Friday they'll have a Flash Giveaway every day on their Facebook page. They also have an EPIC Rafflecopter giveaway you can enter to win right here at the bottom of this post. On Thursday they're hosting a Cloth Pad Chat with EIGHTEEN winners chosen from those who attend and who knows what else they'll share, Sue always has something up her sleeve! Pink Lemonade Shop is thrilled to have been in business 9 years. They've come so far and they can't wait to see what the next 9 years has in store for them. Flash Giveaways will be daily and the sponsors include, in order of appearance, Taylor's Pure & Natural, Eco Sprout, Grace Green Beauty, Smart Bottoms and Eclipse Sun Sleeves. This giveaway includes prizes from Allen's Naturally, Eyla's, Logan + Lenora, Momme Meals and us, Pink Lemonade Shop! Our Cloth Pad Chat w/ Flash Giveaways is Thursday May 26th at 7pm est. Nine winners will be chosen to receive 50 points each and nine winners will be chosen to receive a mystery cloth pad or pantyliner! Winners must be present to enter to win and will be chosen at random from those who participate. *The Cloth Pad Chat prizes are open to both USA & International winners. RSVP for the Cloth Pad Chat here. I am so glad to read your wonderful article. I'm looking forward to read more of your works and posts. You did a good job! Try to visit my site too and enjoy. Giveaway ended but wanted to note is saved their website to look further into for future use for pads.